Philadelphia's DeMarco Murray (29) leaps over Dallas Cowboy Brandon Carr (39) during their game on Sunday, Sept. 20, 2015 at Lincoln Financial Field. Upper Moreland players jump on top of teammate Randy Meehl (11) to celebrate after he hit a single to get a runner home in the bottom of the seventh during their game against Phoenixville in Upper Moreland on Tuesday, May 24, 2016. Upper Moreland won the game 1-0. Cardinal O'Hara goal keeper Carrie Zamonski (31) punches the ball away from teammate Alex Patrick (24) and Conwell-Egan's Bailey Brown (24) during their game at Conwell-Egan Catholic High School in Bristol Township on Thursday, Sept. 11, 2014. Council Rock North's Josh Shalinksy wins his 100th career match against Pennsbury's Connor Gowton in their 170-lb bout during their match at Council Rock North on Wednesday, Dec. 23, 2015. A group of boys react to players losing control of the ball in front of them during the District 12 AAAAA title game of Archbishop Wood against Martin Luther King High School at Father Judge High School in Northeast Philadelphia on Friday, March 3, 2017. Wood won the game 87-51. Holy Ghost Prep baseball players celebrate during their 12-1 District One final win against Sun Valley at Spring-Ford High School in Royersford on Wednesday, May 27, 2015. Arhcbishop Wood's Erin Morgan (22) falls to the bottom of a celebration pile following their Philadelphia Catholic League girls basketball championship game on Monday, Feb. 22, 2016 at the Palestra in Philadelphia. Archbishop Wood won the game 40-36 over Neumann-Goretti. Faith Christian's Charles Ervin (20) is the last to the locker room after pausing to take a moment to himself after a 67-58 loss to Girard College during their PIAA Class A boys basketball semifinal game at Spring-Ford High School in Royersford on Monday, March 20, 2017. The game eliminates Faith Christian from state playoffs. Eagles cornback Nolan Carroll (23) tackles a fan who rushed the field during their game against the Cowboys on Sunday, September 20, 2015 at Lincoln Financial Field. Girls competing in the Penn Relays line up before their races at the starting line at the University of Pennsylvania in Philadelphia on Thursday, April 24, 2014. Falls' Brandon Garrett (11) splits his bat in two on a hit during their game against Northampton at Kopper Kettle Field in Southampton on Sunday, July 14, 2013. 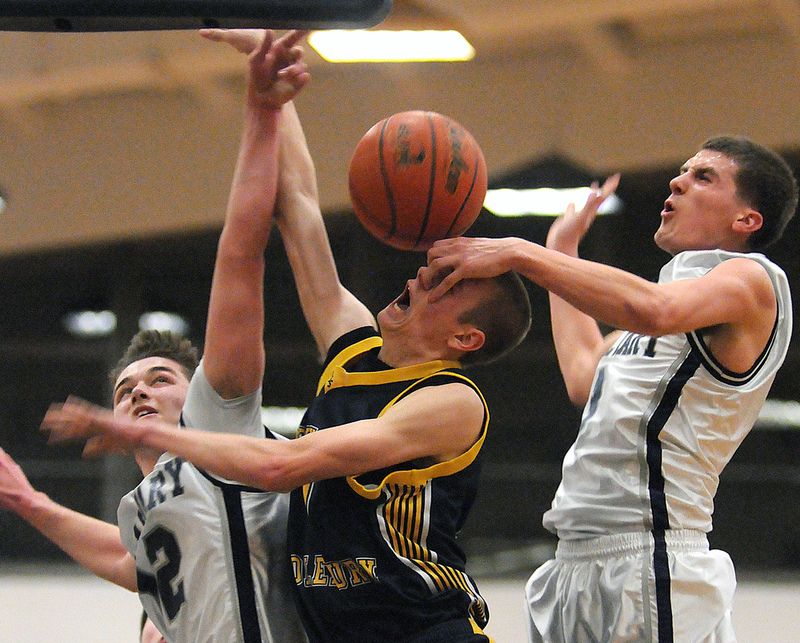 Calvary Christian's Sam Bair (12) and Jonathan Boback (3) try to block New Hope-Solebury's Jack Dougherty (1) from making a shot during New Hope-Solebury's three-point loss to Calvary Christian on Tuesday, Feb. 25, 2014 at Cheltenham High School. Calvary won 58-55. 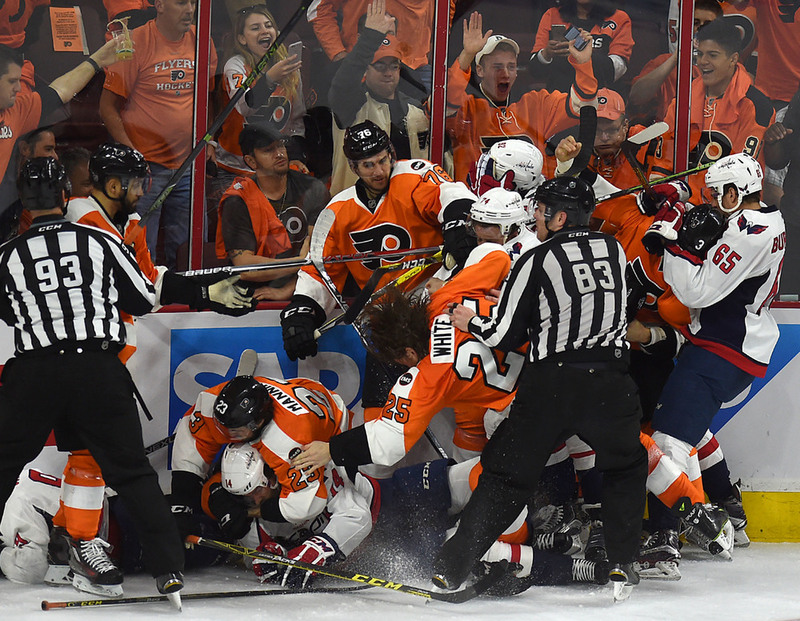 Flyers player Ryan White (25) falls down in the middle of a huge pile of fighting players from both teams during their playoff game against the Capitals at The Wells Fargo Center on Monday, April 18, 2016. The Flyers lost 6-1, but went on to win two more games against the Caps in their seven-game series. Council Rock North's Riley Thompson (3) puts his hands in the air after getting an offensive foul call against him that left him bleeding during their game in the opening round of the Athletes Helping Athletes Classic at Council Rock North on Tuesday, Dec. 29, 2015. Central Bucks South won the game 36-30. Council Rock South's Shannon Taub participates in the high jump championship during the opening day of the Penn Relays on Thursday, April 23, 2015 at the University of Pennsylvania's Franklin Field in Philadelphia. Council Rock South's Andrew Ridings swims the 100-yard butterfly during their swim meet at Council Rock North in Newtown Township on Friday, February 3, 2017. Northern Burlington's Zach Gakeler (32) rips his jersey immediately following their last out of the game, losing their state Group 3 semifinal game at Rider University in Lawrencville, NJ to Burlington Township on Tuesday, June 4, 2013. Tiger Woods prepares to put at Hole 17, a par of 3, during round 2 of the U.S. Open at Merion Golf Club on Friday, June 14, 2013.